Italian Lire are valued for their gold content and their classic design features. These highly-tradeable gold coins are a fine example of European coinage from the mid to late 19th century. 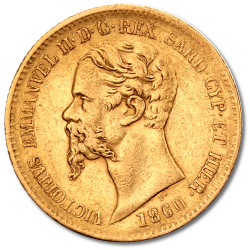 We stock historical Italian 20 Lira gold coins featuring various Kings of Italy including Umberto I (1879-1897) Emmanuel II Sardinia (1850-1861) and Emanuele II (1861-1878) they are VAT Free to EU buyers at coininvest.com. Their rarity makes them appealing to collectors and their 900/1000 gold content ensures that they are of equal interest to investors.